Tropical tree plantations may be an important component of the global carbon cycle because they represent a carbon sink that can be manipulated by humans and they ca mitigate the effects of tropical deforestation, which is the main biotic source of atmospheric carbon (Houghton et al., 1983). Therefore the model is designed to assess the above ground-biomass for two even-aged, single species plantations with the same site class (Pinus patula and Eucalyptus saligna) as an attempt to quantify the carbon storage potential of the two species and their possible roles in carbon sequestration and atmospheric carbon dynamics. During the study samples were collected from Sao Hill Forest Project - Mafinga area, Iringa, in P.patula and E.saligna stands and trial plots planted adjacent to the project area between 1978 and 1997.Startified random sampling design was used. Sample plots were established in different aged stands of Pines and Eucalyptus. For Pinus patula, the ages include planted stands of 3,10,17 and 22 years. For Eucalyptus saligna, the ages include planted stands of 3,5,10 and 14 years. Stem wood biomass for each age class was calculated as the product of wood density and stem wood volume. The Correction factor (mean fraction of carbon in dry biomass) for carbon mass conversion usually range from 0.4 –0.5 as recommended by different researchers. Hence for this case an average of 0.45 is used. The basic density formula has been used since it involves few assumptions and errors compared to the conversion from yield data. · Carbon without Project case = 10% of carbon with Project case. · Mortality will vary with tree age for both species. The amounts of carbon stored in living P. patula trees seem to increase with time. 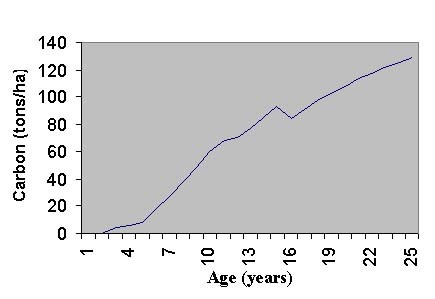 But carbon is lost during the course of rotation as a result of thinning and natural mortality, as shown in Figure 1. 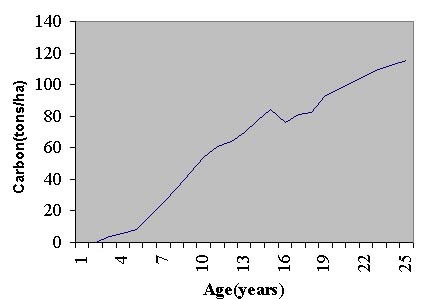 The figure show that Carbon will decrease at age 15 where thinning will occur. Cuevas et al did a study on above and below-ground organic matter storage and production in a tropical pine plantation and a paired broadleaf secondary forest. He found that the Pinus caribaea plantation had significantly more mass aboveground than the secondary forest (94.9 vs 35.6 t/ha for biomass and 10.5 vs 5.0 t/ha for litter. Marland (1998), also asserts that the carbon-sequestration potential of pine plantations ranges between 6 and 18 t/ha/yr, and of eucalyptus plantations between 10 and 24. 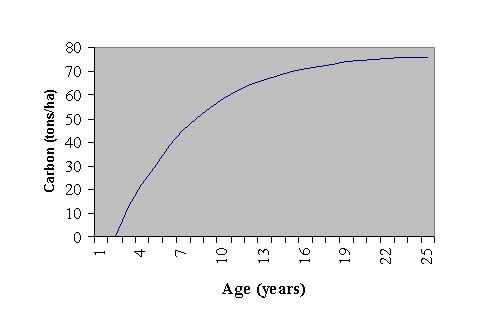 The carbon offset curve show that carbon increase with time as shown in Figure 2. Therefore for a Plantation of Pinus patula a total of 115.58 thousands tonsC/ha may be offset in a single rotation. Figure 2. Carbon offset curve for Pinus patula. Figure 3. 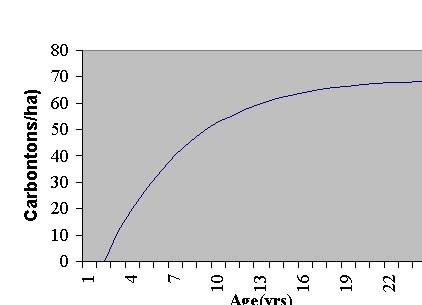 Biomass development curve for Eucalyptus saligna. Figure 4. Carbon offset curve for Eucalyptus saligna. The study shows that establishment of Pines and Eucalyptus plantations is seen as an efficient way to create carbon sinks due to rapid increment rate soon after establishment. Brown et al. (1985) predict that the sink function to become more significant in the future, attributed to the increase in the rate of establishment and the large areas of young plantations, which will sequester more carbon as they develop and grow into older age classes. 1. Brown, S., Lugo, A. E & Chapman, J. 1985. Biomass of tropical tree plantations and its implications for the global carbon budget. Canadian journal of forestry Research, 16: 390 – 394. 2. Cuevas, E., S. Brown and A.E. Lugo (1991) Above and below-ground organic matter storage and production in a tropical pine plantation and a paired broadleaf secondary forest. Plant and Soil 135, 257-268. 3. Iddi, S., Hamza, K.F.S. & Mbarouk, A.A. 1998. Basic density and fibre length of Eucalyptus maidenii (F. Muell) and E. saligna (S.M.) grown at Sao Hill, Tanzania. Faculty of Forestry & Nature Conservation, SUA, Record No. 70, 9pp. 4. Ringo, W.N and Klem, G.S. 1980. Basic Density and Heartwood Content in wood of Pinus patula from Sao Hill. Division of Forestry, FAFV, UDSM, Record No. 14, 17pp. 5. Houghton, R. A., H. E. Hobbie, J. M. Melillo, B. Moore, B. J. Peterson, G. R. Shaver and G. M. Woodwell, 1983. Changes in the carbon content of terrestrial biota and soils between 1860-1980: a net release of CO2 to the atmosphere. Ecol. Monograph, 235-262. 6. Marland, G.: 1988, The Prospect of Solving the CO2 Problem Through Global Reforestation, Carbon Dioxide Research Division, U.S. Department of Energy, Washington D.C., U.S.A.
Desertification puts at risk the livelihoods of around 1 billion people in the drylands of over 100 countries where about 80% of productive land in arid and semi-arid areas suffer from moderate to severe desertification. * Desertification undermines food production then affects socio-economic of local population then triggers poverty, also lead to ecological degradation, migration and conflicts. * The major causes, which lead to desertification of lands, are poor land use practices, overgrazing and population pressure. Study was done in one of the driest district in the country, characterized by periodic droughts and prolonged famine conditions. Author conducted survey to some villages in the area to identify causative of extended desertification. He ascertain that environmental problems to the area are due to many factors among them being poor farming systems (where people are ploughing in sand soils which facilitate sand migration and lead to sand dunes, poor soil (low fertility). * Poor are the ones who bear adverse consequences of environmental degradation in fragile ecosystems. 4.restore ecological balance, contribute to promotion of sustainable development strategies with full participation of local people/stakeholders. Project promoted planting of drought resistance varieties such as ber(regu), mangoes, tamarindus and other fruits tree which takes 3-4 years to start yielding the crop, this has positive response from villagers who reveal to be financially beneficial in the long run in lieu of cultivation on the sand-filled lands. Efforts to improve environmental conditions will certainly contribute to helping poor in improving their livelihood. Project has a very good strategy to combat desertification. But the author has to show clearly and in details how he is going to implement those objectives apart from saying people will be encouraged to plant drought resistance species. In early 70 and 80’s many projects in developing countries have came up with a very nice objectives and goals but have failed to implement or disseminate their findings to the entire area due to some unforeseeable factors. And as a result lead to unimplemented and expensive techniques which lately opposed by local population which can be same to this kind of the project too if strategy are not in place. Should the author give us some explanation on how he will meet objectives 2 and 4. Also it is said majority of the villages studied their population are illiterate and farming on poor land and they are depending on agricultural for their daily subsistence, I wonder how these people will shift to new technology without extension services to address the problems.